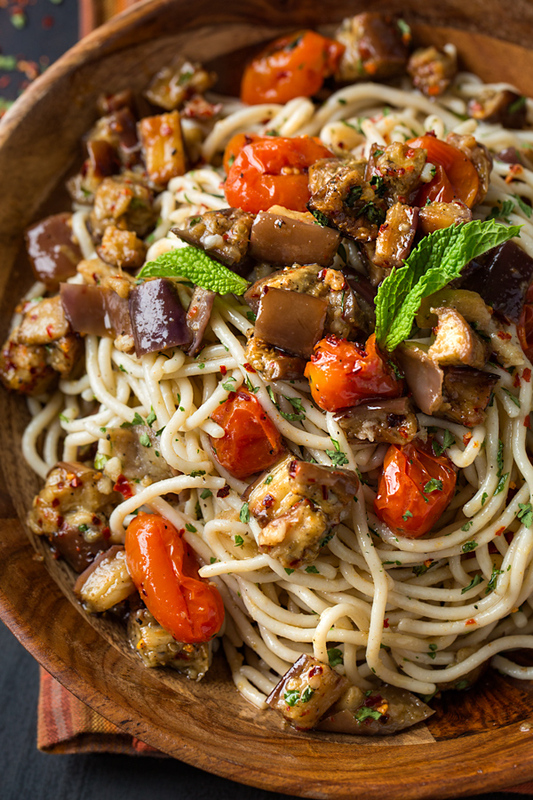 This gluten-free pasta salad, mediterranean style, is a bold, zippy, and veggie-filled pasta salad recipe made with brown rice noodles, and loaded with tender roasted eggplant and juicy cherry tomatoes. The demand for gluten-free pasta salad recipes doesn’t seem to be dwindling down any time soon, and with all of the delicious and wonderful offerings available these days, maintaining a diet low in (or even completely free of) gluten is more do-able than ever. Whether it’s a dietary necessity or just a desire to cut back a little on gluten whenever possible, it’s great to know that taste and texture need not be sacrificed at all when it comes to enjoying some of our favorite pasta salad recipes in the warmer months. It’s little switches like substituting traditional wheat-based pasta with a brown rice pasta and then loading up on flavorful ingredients such as vibrant and palette-enticing herbs, roasted veggies and a light, zippy dressing that make a delicious and nutritious difference, and this brown rice pasta salad with roasted eggplant and cherry tomatoes is the perfect zesty pick. Gluten-free pasta can be a delicious alternative, but it definitely needs a little extra love so that it turns out just right. Unfortunately, the instructions on the gluten-free pasta packages are not always accurate, so one of the best things a home-chef can do is taste often—if you’re loving what you’re making, there’s a good chance they will be too. Start by filling a large pot with lots of water (more than you you’d use for regular pasta), and enough salt to the water so that it tastes a little like ocean water (I like to also add in a small drizzle of olive oil to make things more viscus, but that’s up to you). Bring the water to a rapid or full boil, then add in your brown rice pasta in increments, separating it a little as it falls into the boiling water; then, using tongs, immediately move the pasta gently around for a minute or two as it begins to soften, to help keep it separated. Reduce the heat so that the pasta now cooks at a lower, gentler boil, as this will help prevent it from breaking up as it cooks; and every now and then give it a gentle stir (I like to use the handle of my wooden spoon as it’s slender and it allows me to sort of “swirl” the noodles rather than grab them with the tongs). Check the tenderness of your pasta beginning at about 7 minutes, and once it’s al dente yet tender, drain and rinse to remove the excess starch. 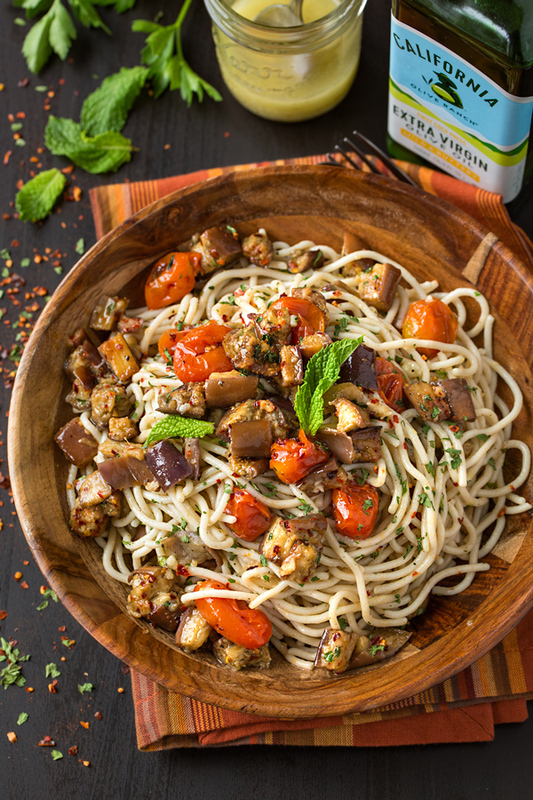 For this Mediterranean inspired gluten-free pasta salad, the cool and tender brown rice noodles are tossed with succulent roasted eggplant and slightly sweet, juicy cherry tomatoes. And for the finishing touches, everything is given a generous drizzle of a simple lemon dressing, plus a healthy pinch of vibrant and fresh herbs, making this pasta salad light, healthy and refreshing. So next time you get the hankering for a cool pasta salad with a mediterranean flair, feel free to leave out the gluten and load up on the flavor and the veg instead. Substitute if needed: You can also use white rice pasta, which is also fairly available next to the brown rice pasta these days; or, you can also substitute another type of gluten-free pasta such as quinoa or corn or a blend, if you prefer those; you can even use traditional noodles (not gluten-free), as well. Go stove top: Feel free to saute your eggplant and cherry tomatoes instead of roasting them, if you prefer. The roasting is nice because you don’t need to babysit the veggies, but it’s another option—just use a cast-iron skillet or some other large heavier pan, and saute until golden and tender. 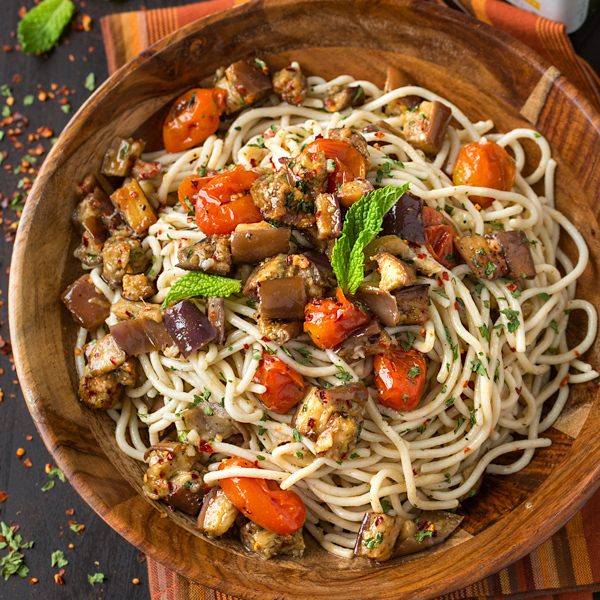 Make ahead: You can prep your ingredients ahead of time to make this pasta salad a breeze the day you’d like to serve it; simply roast your eggplant and cherry tomatoes, prepare your lemon dressing, and cook your pasta; then, just toss everything together the day of. Leftovers? : This pasta salad will keep for several days in the fridge, and any leftover dressing for about a week or two. 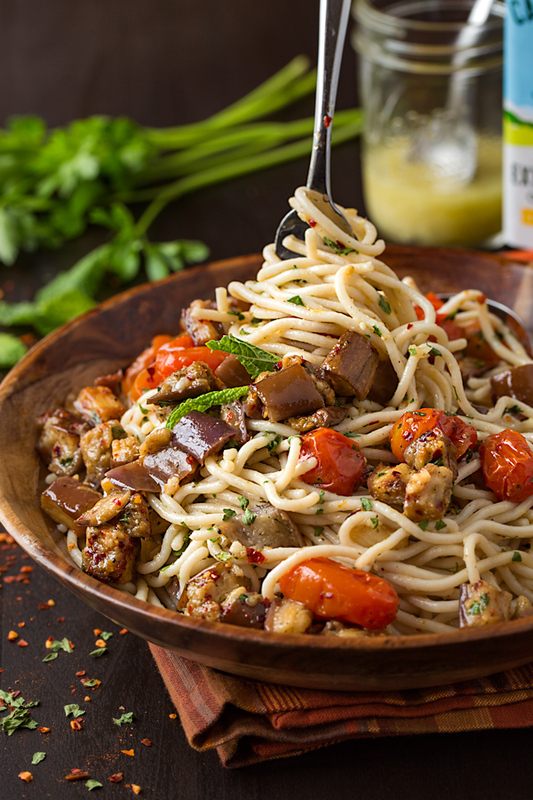 Cool and twisty, this light and healthy gluten-free pasta salad is filled with roasted eggplant and cherry tomatoes, plus vibrant herbs and a refreshing lemon dressing. -Preheat the oven to 400°, and line a baking sheet with parchment paper. 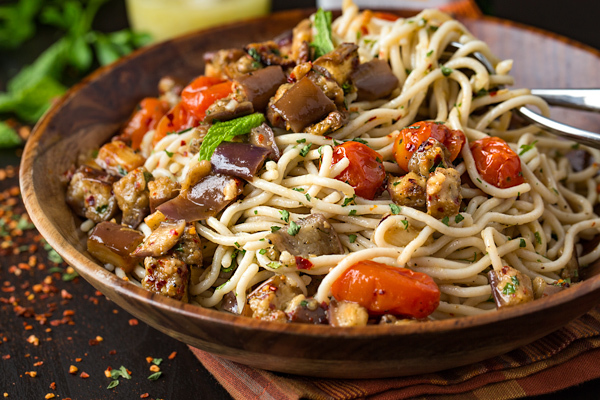 -In a large bowl, toss together the cherry tomatoes, diced eggplant, about 3-4 tablespoons of the oil, the salt, pepper, cumin, red pepper flakes and granulated garlic, and turn out onto the parchment-lined baking sheet to bake/roast for 30-35 minutes, until slightly golden and tender; then, allow to cool slightly. -Place the cooked and cooled brown rice pasta into a large bowl, pour in some of the lemon dressing (go slow until you get your desired amount), and add in the cooled cherry tomato/eggplant mixture; sprinkle in the chopped herbs and toss everything together gently, and taste to see if any additional salt/pepper or dressing is needed; serve immediately, or keep covered and chilled in the fridge to serve later.